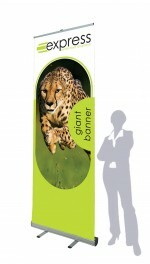 Wide banner stands start from 1000mm wide and go up to 2000mm wide. These displays provide the flexibility of being a banner stand with their small footprint, compact storage and ease of erection with the versatility of providing a large backdrop. Talk to us today on 0808 274 5400 to discuss your wide banner stand requirements. Or, see our full selection of pop up banners. Wide banners are available in four sizes: 1000mm, 1200mm, 1500mm and 2000mm wide. The smallest in our range is our 1000mm wide banner stand. 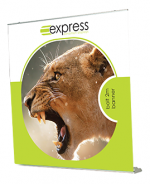 This size provides a bit of extra leg room compared to standard sized banners which are typically 800-850mm wide. These are a great choice if you’re looking for a slightly bigger display for your graphics to make a bigger impact, but don’t have a lot of floor space to play with. Our 2000mm wide banner is nearly as big as a pop up stands, but with a much smaller footprint. As well as being a smaller alternative to a pop up, these are a great choice to use as photography backgrounds for awards ceremonies and press walls. To create a backdrop, simply repeat your logo on the design – this will ensure for photography that your logo is clearly visible, no matter where people stand. 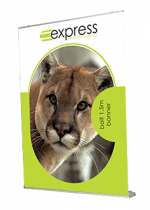 In our range of wide banner stands, we have two options, our Rapid and Bolt banners. 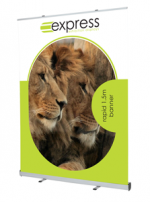 Rapid banners have two twist out feet for support to give extra stability. Its snap rail fitting at the top also makes it possible to replace your banner display graphic when needed. We would always advise to send your base unit back to us to replace your graphics, as this can be a tricky process. Bolt banners have hidden bases, where the graphic is front loading, so the graphic seemingly disappears into the floor. This allows you to have an uninterrupted floor to 2100mm high graphic, where only a small part of the banner base is visible.